A hotel maintenance worker must perform a variety of responsibilities to ensure hotel maintenance standards are achieved, from carrying out repairs to cleaning up facilities. 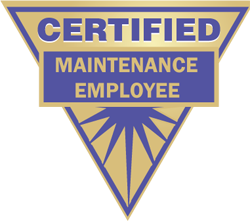 The Maintenance Employee certification brings the professional clout to the people who are in the front-line with guests. Certification Overview: The Maintenance Employee certification recognizes the skills and knowledge needed to succeed as a professional in a maintenance position at a lodging property. The line level certification is supported by the START (Skills, Tasks, and Results Training) program. This course provides training in maintenance key task performance, general hospitality knowledge, and the professional and soft skills needed in the hospitality industry. Training is provided in a classroom setting at a local Denver hotel property. Course study materials and the certification exam are provided in the registration cost. Successful candidates will receive a certificate, lapel pin, and global recognition for their accomplishment. Who should attend this course? New and existing maintenance department employees. Registration for this course will close on Friday, March 1st. CLICK HERE TO DOWNLOAD ADDITIONAL LOCATION AND SCHEDULE INFORMATION. Space is limited to 35 students for this course section, so please register early!!! CHLA University Questions: Please email [email protected] or call 303-346-4478. Website Questions: Please email or call Sharon ([email protected]) 303-297-8335 Option 3.